Restoring All Things, Warren Cole Smith and John Stonestreet. Grand Rapids: Baker Books, 2015. Summary: This book narrates the impact mediating institutions and efforts by Christians in bringing restoration into some of the most challenging situations faced by our society today. Wherever we turn we face stories of huge challenges in our own society and around the world. Poverty, persistent racism, refugees, the oppression of women, evidence of the decay of our culture in some of its art forms. Often we look in vain for solutions from our political and educational institutions. This book suggests that for people of faith, there is reason for hope. What is good in our culture that we can promote, protect and celebrate? What is missing in our culture that we can creatively contribute? What is evil in our culture that we can stop? 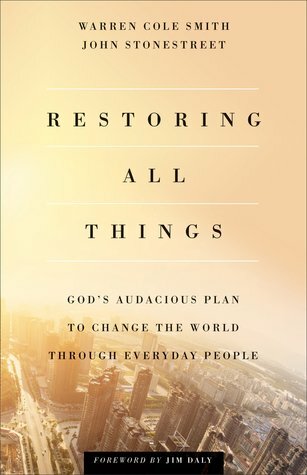 What is broken in our culture that we can restore? They then go on to contend, drawing on de Tocqueville, that mediating institutions or voluntary associations of individuals between the individual and the state, have been part of the genius of the American experiment, and that such institutions, being led by people of faith, are having a profound impact on the most challenging problems we face today. They also argue for helping that helps that provides not a hand out but a hand up, and for a redeemed form of capitalism that unleashes people’s creative potential for the benefit of all. Succeeding chapters proceed to narrate the stories of people living out this vision in the realms of fighting abortion, human trafficking, education reform, restorative justice, racial reconciliation, academic faithfulness, redeemed sexuality and marriage, the dignity of those who suffer and are disabled, care for orphaned and abandoned children, and the arts. They profile the often unheralded work of pregnancy care centers in helping women choose alternatives to abortion. They describe justice reforms that provide reconciliation and reparations between perpetrators and victims of crime. And one of my favorites is that they describe scholars who bring their faith to bear on their scholarship with excellence, sometimes to the scorn of their academic colleagues. Each chapter includes recommendations of further steps people can take to be informed and to act. There is much to affirm in this book. The stories give us cause to be hopeful that everyday acts of faithfulness where our great loves meet the world’s great need can have lasting consequences for good and that we don’t have to wait for our political institutions to shape up. The areas of involvement they cite are all ones I would endorse and what I most appreciate in these is the balance of treatment–for example in spotlighting efforts both in Christian education, and in Christian involvement in the public schools. They feature both the contemporary art of Makoto Fujimura and the rap music of Lecrae. They uphold traditional views of sexuality and the dignity of, and need for respectful dialogue with, LGBT persons. What I thought the book represented was a thoughtful and charitable Christian conservative perspective. It didn’t rail against more progressive concerns about immigration, or the environment, nor the impact of exploitative corporate and economic policies on the poor of the world. At the same time, it didn’t tell stories of the work Christians are doing in these areas. It simply didn’t include these efforts to “restore all things” and by its silence ended up suggesting an agenda that seeks only to “restore some things”. And by not articulating a vision of the faith large enough to include these concerns, it proposes only a slightly more nuanced version of the divides and polarities of choosing either column A or column B in parallel with the political fault lines in our country.